Photograph This! : Shoot what you like with a touch of ring flash. Shoot what you like with a touch of ring flash. things that I have got for myself (even if sometimes it means waiting before I wear/use them). what you have shot and ask you for a similar look. This time I picked these shoes from Above and Below, a small company in London that make unique sneakers. They are made of reused fabric from the London Tube and recycled leather. Pretty neat uh? Their website even has a soundtrack that is rather spot on. So the shot: the scheme was fairly standard: gridded spot behind/above, side speedlite behind the shoes and on camera left (made sure that it did hit the logo), ring +softbox as fill. The color scheme was a play on the dominant colors: green and blue. I added layers of magenta (shadows) and yellow (highlights) to highlight them. As a final touch I dialed down the contrast on the highlights to give the image a bit of a 'film' look. 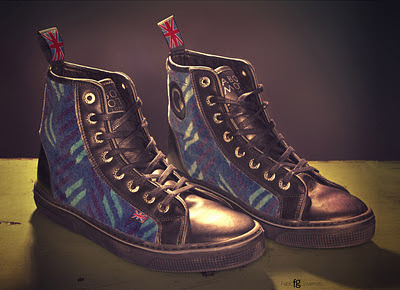 Nice shoes (and nicely shot)- and I recognise that fabric from my childhood Tube journeys on the Northern Line! I am a commercial photographer based in Seattle, WA...I also have another career where I get paid to look at things very far away.